Sewing has again been interrupted by a new house guest. This time, it is Prowler, a 6-week old foster kitten with an upper respiratory infection. He gets medicine twice a day and frequent steam showers. My daughter walks around with him in a makeshift baby carrier and barely lets him out of her sight. (Which is a good thing because the first time she did, he ran straight into the dishwasher housing and we had to take it apart to get him back out!) Luckily, kittens are much more independent than puppies and so, as long as she is around to watch him (or he is confined to her bedroom and bathroom), I can still get some stuff done. The problem is that she is going to have a tough time giving this little guy up when it is time for him to be adopted. We really don’t want to bring him back to the shelter where he will have to go in a cage. We would much rather see him adopted outright, so if anyone is looking for a little black fuzzball to love, please send us a message! As for the sewing, I did finally decide on a “pattern” for the back of the memory quilt. I sewed three of the four extra fabrics from the front together, then slashed them to add strips of the fourth. Less than perfect, but cute and good enough for the back. 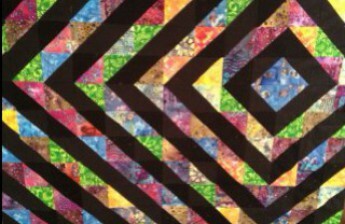 It’s not boring and doesn’t rely on right angles which would invariably be different right angles than what is on the front of the quilt. What I do need to remember is that the vertical and/or horizontal strips should always go first before the diagonals because otherwise things don’t line up properly. I know I’ve made that mistake before and I’m sure I’ll make it again! And then, I got mad at my other daughter and took it out on the quilt. I took what was left of the fourth piece of fabric and just sewed it straight onto the side of the blue and orange one. So there! Okay, so I’m not really sure what that might have proven or why my daughter would possibly care or what my point even was. I’m sure the therapist will have fun with that one. It did have the effect of finishing the backing. Well, at least I thought it did. I taped the backing to the floor, took out the good batting (Warm & Natural Cotton) and taped that to the floor on top, and then tried to lay out the quilt top. No matter which way I turned it, it was still too big. Which tells me that either (or both) the quilt top or the backing are far from square (or rectangular) because based on the measurements I took, the backing is five inches larger than the top! So, now I am stuck sewing scraps around the backing edges to gain just a few more inches. UGH!